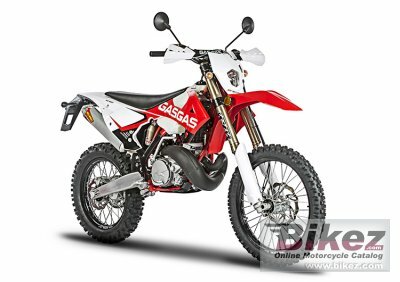 2018 GAS GAS EC 300 E4. Picture credits - GAS GAS. Submit more pictures. Gas Gas has completely reinvented its iconic Enduro. The new EC demonstrates total commitment to the very highest quality components. With new frame, engine, suspension, geometry and an endless list of new parts. Clutch: Multidisc in oil bath. Magura clutch pump. Rear suspension: Aluminium and Linkage system swingarm. KYB mono shock. Wheels: Excel Aluminium spoke rim. Metzeler Six Days tyres. Seat height: 960 mm (37.8 inches) If adjustable, lowest setting. Ask questions Join the 18 GAS GAS EC 300 E4 discussion group or the general GAS GAS discussion group. Bikez has discussion forums for every bike. View comments, questions and answers at the 2018 GAS GAS EC 300 E4 discussion group. You can sign up for e-mail notifications when other riders answer you. If you have extensive experience with the MC, please send us a review. If you consider buying this bike, you should view the list of related motorbikes Look at photos. Compare technical specs. And check out the rating of the bike's engine performance, reliability, repair costs, etc. You can compare the rating with other bikes.